Amram and his quartet perform music he has composed celebrating half a century of collaborations with playwrights, choregraphers, authors, poets and musicians from the 50's through today's innovative young artists. Surprise guest join Amram and his quartet with Kevin Twigg, drums and glockenspiel, John Dewitt,bass and Adam Amram congas. Actor John Ventimiglia of The Sopranos and other surprise guesta will also appear. Jan 7 • 7:30 PM • Tarpon Springs Performing Arts center. Tarpon Springs, FL. Dedicated to the memory and legacy of Dimitri Mitropoulos. Amram conducts the Renaissance Classical Orchestra in music by Pachelbel, Borodin, Bach, Teleman, Scott Joplin, Duke Ellington and Mozart. Jan. 14 • 7:30 PM • Olympia, WA. Washington Center for the Performing Arts. David Amram Quartet: <b><i>From Cairo to Kerouac - classics of jazz, World Music and the spoken word</i></b>. Jan 15 - Jan 25 • Continued work composing and orchestrating "Symphonic Variations on a song by Woody Guthrie", and "Missa Manhattan" for narrator, chorus and orchestra with text by author Frank McCourt, and completing a new book "Nine Lives of a Musical Cat"
Jan. 26 • 8:00 PM • Schein Hall, Sannibel, FL. Amram conducts the Renaissance Classical Orchestra in music by Pachelbel, Borodin, Bach, Teleman, Scott Joplin, Duke Ellington, Mozart and Amram's setting of the finale of Kerouac's On The Road for narrator and string orchestra. Jan 30 • 7:30 PM • St. Pablo Catholic Church, Marathon, FL. Amram conducts the Renaissance Classical Orchestra in music by Pachelbel, Borodin, Bach, Teleman, Scott Joplin, Duke Ellington and Mozart. Ticket info and address TBA. Jan 31 • 5:00 PM • Florida International University, Miami, FL. Wolfe University Center. Concert by the FIU Center for Spirituality. Spirituality and the Beats: Buddhism, Bach and Be-bop - Seminar by Amram. Feb 6 • - • Fairfield, CT. Artist in residence, Fairfield University. Amram conducts orchestra rehearsal for program of the music of Leonard Bernstein, Gershwin and Amram. Feb 10 • - • Concert for Native American Sacred Run - with Floyd Redcrow Westerman, Dennis Banks, Peter Coyote and others TBA. Studio Z, 314 11th St., San Francisco, CA. See this link for details. Feb 12 - 15 • - • Hilton Head, SC. Performances of Amram's Flute Concerto, written for Sir James Galway with Mimi Stillman, flute soloist with the Hilton Head Symphony, and appearancs in schools demonstrating the roots of symphonic music. Feb 23 • 8:00 PM • Huntington Pointe, FL. Amram conducts the Renaissance Classical Orchestra in music by Haydn, Dvorak, Pachelbel, Borodin, Teleman and Mozart - also Amram's Theme and Variations on Red River Valley for flute and strings. Soloists TBA. Mar 2 - 3 • 7:00 PM • Lake City (Dowling Park), FL. Advent Christian Village (Mar 2), matine concerts for young people, Community Concerts of Lake City(Mar 3, 7:30 PM). Program TBA. Mar 4 • 3:00 PM • Mobile Chamber Music Society, University of South Alabama, Mobile, AL. Amram conducts the Renaissance Classical Orchestra in music by Pachelbel, Borodin, Bach, Teleman, Scott Joplin, Duke Ellington, Mozart and Amram's setting of the finale of Kerouac's On The Road for narrator and string orchestra. This concert will be in conjunction with an exhibition for David Amram Week in Mobile with photographs, book signings and display of Amram caricatures. Mar 12 • - • Littleton MA. Indian Hill Music Center - celebrating the 25th anniversary of the premier of "Ode to Lord Buckley", Amram's concerto for saxophone and orchestra. Bruce Hangen, conductor; Kenneth Radnofsky, saxophone soloist. For details, see www.indianhillmusic.org. Mar 17 • 7 PM • New York Historical Society. "Birdwatch" - Amram plays flute, ocharina and whistles as well as compositions celebrating the sounds of birds on the American continent to accompany the Audibon Society's exhibition. Mar 20 • 8:00 PM • Classic Chamber Concerts at Sugden Community Theatre, Naples, FL. Amram conducts the Renaissance Classical Orchestra in music by Pachelbel, Borodin, Bach, Teleman, Scott Joplin, Duke Ellington, Mozart (Piano Concerto). Soloists TBA. Mar 23 - 28 • - • New York City. "Kerouoac's Road: Stops on the Way" Amram joins Denver University's traveling students and international guest faculty for programs in New York City and Lowell, MA. Program to include Amram's "Cairo to Kerouac" and readings from Amram's two books "Offbeat: Collaborating With Kerouac" and"Vibrations". Mar 28 - Mar 31 • - • Artist in Residence, Fairfield University, Fairfield, CT. Seminars, Tuesday Mar 28 - work with jazz ensemble and arts students; Thursday Mar 30 12:30 to 1:30 - seminar for students and the public "The Influence of Judiasm On the Music of Leonard Bernstein and David Amram" - co-sponsored by the Judiac Studies Dept., evening rehearsal of symphony concert of music by Bernstein, Gershwin and Amram; Mar 31, 7:30 PM - Performance of music by Bernstein, Gershwin and Amram and special piece created involving drama and dance students. Apr 7 • - • "Tribute to Lord Buckley". Bowery Poetry Club, New York City. Amram and his trio play and he discusses his accompanying Lord Buckley in his final performance the night before he died in the fall of 1960. Apr 8 • 7:30 PM • Five Towns College, Dix Hills, Long Island - "The Beatles' Magical Orchestra". Young People's Concert introduces the instruments of the symphony orchestra in an authentic recreation of 20 classic Beatles recordings. Amram hosts and conducts the 40-piece orchestra, which includes four folkloric musicians from India. Pre-concert lecture starts at 6:45 PM. Adults $25, Students and Children $15. For information and tickets, call 631-656-2148. Apr 9 • - • An evening of Amram's compositions at the Brooklyn Center for the Performing Arts - chamber music and world music compositions with soloists Kenneth Radnofsky and others TBA. Apr 10 • - • Denver University - Marisco Visiting Professor and Leo Block Distinguished Visiting Professor. Working with students from the biology, English, anthropology, Judaic studies, sociology and music departments. Apr 22 • - • Portsmouth, NH - Jazzmouth music festival. Apr 23 • - • Denver University - Marisco Visiting Professor and Leo Block Distinguished Visiting Professor. Working with students from the biology, English, anthropology, Judaic studies, sociology and music departments. Apr 28 - 30 • - • Brown College, Providence, RI. In residence for performance of Amram's saxophone concerto "Ode to Lord Buckey". Saxophone soloist Andrew Alligretti with the Brown Wind Symphony. Concert Apr 29, 8:PM at Salomon Hall - 19th annual Eric Adam Brudner Memorical Concert. Admission is free and open to the public. Amram will also be doing work with the English Dept. about work with Hunter S. Thompson and Jack Kerouac. The Department of Music will host a seminar by Amrom at 4 PM on the 28th - "Jazz, World Music and Classical Composition". Sat. May 6 • 1:45 PM • David Amram Trio - Musical tribute to Harold Clurman with whom Amram collaborated as musical director at the at the Lincoln Center Theater from 1964 through 1966. 31 W. 27th St., New York City, NY. May 8 - 13 • - • Amram conducts symphony concert. See Amram's schedule online (requires Adobe Acrobat Reader). May 13 • - • AMRAM CONDUCTS CONCERT OF RECONCILIATION IN LATVIA - David Amram has been invited to conduct the Leipaja Symphony in Leipaja Latvia, in a program honoring the contributions of the Jewish community prior to world War II, and the memory of all who perished there. The concert also celebrates the rebirth of the vital new community being formed in 2006, where descendents and the remaining survivors are returning to live. May 15 - 26 • - • University of Denver - see Amram's schedule online (requires Adobe Acrobat Reader). May 23 • 7 - 9 PM • From Kentucky to Colorado: The Literary Legacy of Hunter S. Thompson - readings with music featuring special guests Juan Thompson and Anita Thompson - 454 Sturm Hall, The University of Denver. See this link. Also a special screening of David Amram's Opera of the Holocaust, The Final Ingredient and an evening of his chamber music performed by the Lamont School of Music. May 27 • 9:00 PM • Festival of the Lower East Side - Theater of the New City, New York City, NY. - Amram performs his music. May 29 - Jun 2 • - • University of Denver - see Amram's Denver schedule online (requires Adobe Acrobat Reader). Jun 5 • - • Brooklyn Conservatory honors the life's work of David Amram as their Musician Of the Year. See their website for details. Jun 9 - 11 • - • Amram conducts members of the Austin Symphony at the Kerrville Music Festival's anniversary concert as the closing event of festival. Jun 13 - 19 • - • Continued work composing and orchestrating "Symphonic Variations on a song by Woody Guthrie", and Missa Manhattan for narrator, chorus and orchestra with text by author Frank Mccourt, and competing new book "Nine Lives of a Musical Cat"
Jun 17 • - • David will be performing at his daughter Adira's wedding, Putnam Valley, NY. Jun 20 • - • Performing at Dennis Duggan memorial service, New York City. Fresh City Life and the Denver Public Library present David Amram and sociologist Audrey Sprenger, Ph.D, hosting a special retrospective of this past historic year, celebrating how On The Road continues to inspire people to travel the world, write their lives and collaborate artistically. The evening will include music performed by Amram and his Denver based trio (Artie Moore-bass and Tony Black-drums) There will be readings by students participating in the last run of Sprenger's cross-country sociology and documentary making course Jack Kerouac Wrote Here, Crisscrossing America Chasing Cool and Amram's personal and musical reflections on the cultural impact of this important literary anniversary. This event is free, and held at the Central Branch of the Denver Public Library. June 22 - July 2 • - • Continued work composing and orchestrating "Symphonic Variations on a song by Woody Guthrie", and "Missa Manhattan" for narrator, chorus and orchestra with text by author Frank McCourt, and completing a new book "Nine Lives of a Musical Cat"
July 3 • - • Independence day special. Cornelia St. Cafe - David Amram's trio (Kevin Twigg, drums; John DeWitt, bass) with Alana, Adira and Adam Amram, John Ventemiglia and surprise guests. July 3 - 8 • - • Continued work composing and orchestrating "Symphonic Variations on a song by Woody Guthrie", and Missa Manhattan for narrator, chorus and orchestra with text by author Frank Mccourt, and competing new book "Nine Lives of a Musical Cat". July 9 • - • Interview with Danish Journalist Lars Gulin for Danish national jazz journal. July 12 - 16 • - • Amram Family Band - Alana, Adira, and Adam Amram (and David) perform at the 2006 Woodie Guthrie Folk Festival. July 17 - 28 • - • Continued work composing and orchestrating "Symphonic Variations on a song by Woody Guthrie", and "Missa Manhattan" for narrator, chorus and orchestra with text by author Frank McCourt, and completing a new book "Nine Lives of a Musical Cat"
July 19 - 22 • - • Interviews in Jack Kerouac's home town for September 7 2007 radio documentary celebrating the 50th anniversary of the publication of On the Road. July 23 - 26 • - • Amram performs with small ensemble as musical director and performer for new CD by gospel and jazz ledgend Lil Greenwood, former vocalist with Duke Ellington's orchestra in Mobile, AL. July 31 - Aug 6 • - • Continued work composing and orchestrating "Symphonic Variations on a song by Woody Guthrie", and Missa Manhattan for narrator, chorus and orchestra with text by author Frank Mccourt, and competing new book "Nine Lives of a Musical Cat"
Aug 7 • - • Cornelia St. Cafe - "50 Years in Greenwich Village". David Amram's trio (Kevin Twigg, drums; John DeWitt, bass) with Alana, Adira and Adam Amram, John Ventemiglia and surprise guests. Aug 8 - 22 • - • Continued work composing and orchestrating "Symphonic Variations on a song by Woody Guthrie", and "Missa Manhattan" for narrator, chorus and orchestra with text by author Frank McCourt, and completing a new book "Nine Lives of a Musical Cat"
Aug 23 - 25 • - • Music tribute to Cuban percussionist Candido, Carolina, Puerto Rico. Aug 26 - Sept 2 • - • Continued work composing and orchestrating "Symphonic Variations on a song by Woody Guthrie", and "Missa Manhattan" for narrator, chorus and orchestra with text by author Frank McCourt, and completing a new book "Nine Lives of a Musical Cat"
Sept 3 • 3pm-4pm • Bradstock Music Festival. West Sayville, Long Island. 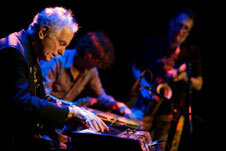 Featured Performer - David Amram's trio (Kevin Twigg, drums; John DeWitt, bass) with percussionist Adam Amram. Sept 4 • - • Labor Day day special. Cornelia St. Cafe - David Amram's trio (Kevin Twigg, drums; John DeWitt, bass) with Alana, Adira and Adam Amram, John Ventemiglia and surprise guests. Special guest Frank Messina reads Mets/Baseball poetry. Will be filmed for Mets Weekly-SNY. Saturday, Sept 9 • - • Featured Performer, Howl Fest, New York City. Further details TBA. Sept 10 • 9:30 PM • Guest artist with the Tommy Goodman Trio. The Turning Point, 468 Piermont Ave., Piermont, New York. Please make reservations now for the show. Call 845 359-1089. Light food and drinks available. The shared influence of Dvorak's legacy, traditional Jewish music and Jazz will be demonstrated by Amram. he will also discuss his year as the first-ever Composer-in-Residence with the New York Philharmonic, chosen by Bernstein. Sept 21-28 • Continued work composing and orchestrating "Symphonic Variations on a song by Woody Guthrie", and "Missa Manhattan" for narrator, chorus and orchestra with text by author Frank McCourt, and completing a new book "Nine Lives of a Musical Cat"
Amram joins the award winning band Black 47 and a host of other supporters, performing at a fundraiser for the candidacy of Malachy McCourt for the next Governor of New York State. Sept 30 • noon-midnight • PERFORMING WITH WILLIE NELSON AND HIS BAND FOR 10TH TIME AT FARM AID. Amram joins Willie Nelson and his band for the annual benefit concert for family farmers. All details for tickets are on Farm Aid webpage. Amram performs his music and also plays with singer Morely and other artists in a program honoring the memory and the music of victims and survivors of the Holocaust. Amram performs for a reunion of authors, journalists, musicians and old friends who are returning for the evening to celebrate the historic meeting place in Greenwich Village where artists of all disciplines met to share ideas and good times with one another. The evening will also honor the memory of journalist Dennis Duggan. Amram is the featured guest artist with the new ensemble "The Classical Planet founded by viola virtuoso Midhat Serbagi with whom Amram has collaborated for fifty three years. The two Sunday afternoon shows are family concerts which showcase music from Europe's great 18th and 19th century composers, as well as classical music, songs and dances of the Middle East, with dancers, a children's choir and special guests artists. See the "Classical Planet" web page for further details. Oct.16-27 • - • Continued work composing and orchestrating "Symphonic Variations on a song by Woody Guthrie", and "Missa Manhattan" for narrator, chorus and orchestra with text by author Frank McCourt, and completing a new book "Nine Lives of a Musical Cat"
and screening of film Pull my Daisywith narration by Jack kerouac and music by David amram, who also appears in the film. Orlando's Kerouac House Writer's Residence interviews with Pete Seeger in Beacon NY,others in Lowell Massachussets and Amram guiding filming of key places in NYC where artists of the 50's gathered. The first field work for a new documentary film. Tickets are availabale at the door or by phone. Amram and his quartet perform his own compositions as well as works by the jazz masters he has collaborated with over the past 60 years, and his quartet accompanies students reading from the works of Kerouac. There will also be a two hour seminar the following morning on the creative process for the English Department, just prior Amram leaving to go to Columbia U.
Amram joins Professor Ann Douglas, author Joyce Johnson and scholar Penny Vlagolpoulos in a seminar at 4 p.m. discussing the signifigance of Kerouac's work today, fifty years after the publication of On the Road Amram will recall his pioneering collaborations with Kerouac for the first-ever jazz-poetry readings done in NYC, as well as their collaborations in classical music and with the community of painters and other artists during the Fifties. At 8 p.m. at the West End Bar, where Kerouac went as a student at Columbia in the Forties, there will be readings from Howl and On the Road with students accompanied by Amram and his quartet, who will also perfrom classics of jazz and world music, and be joined by student musicians at the end of the evening for a jam session. Performance at a gala starting off the new season at the refurbished Helen Hayes Theater in Nyack New York. See web for further details. Surprise guest join Amram and his quartet with Kevin Twigg, drums and glockenspiel, John Dewitt,bass and Adam Amram congas.also a celebration of his upcoming 76th birthday Nov 17th. Museum of Natural History at the IMAX Theater. Prior to screening of new documentary film "Doc" produced and directed by his daughter Immy Humes. Amram and others discuss the life and times of author Harold Doc Humes, and amram will perfrom music in his honor. Amram joins a panel to play and discuss his 50 years as a champion of World Music and its importance in festival programming throughout the USA and Canada. He will also perform a small concert with his son Adam Amram and perform with young musicians throughout the day and during evening events. Cathedral of St. John the Divine, New York City, NY. Admission free. Performance of Amram's Niggun, the 2nd movement of his symphony Songs of the Soul performed by the Brooklyn Philharmonic for the annual Concert of Rememberance of the Holocaust. The music Amram will perform for the opening evening celebrates the shared cultural heritage of both the Israeli and Palestinian scholars attending the conference, showing how the music of the Middle East, like the work discovered by the archeaologists attending the conference, transends politics and reflects the common ties. Nov 15-18 • - • Continued work composing and orchestrating "Symphonic Variations on a song by Woody Guthrie", and "Missa Manhattan" for narrator, chorus and orchestra with text by author Frank McCourt, and completing a new book "Nine Lives of a Musical Cat"
nov 19 • 2pm-7pm - • FIVE HOUR RADIO SALUTE TO DAVID AMRAM'S 76TH BIRTHDAY OF NOV 17. Amram will be interviewed live by radio station WKCR in New York by host Charles Blass, and have his symphonic,operatic, film, theater, jazz, latin and world music compositions played as well as talking about the people he has worked with with since his teens throughout the world. Nov 20-Dec 31st • - • Continued work composing and orchestrating "Symphonic Variations on a song by Woody Guthrie", and "Missa Manhattan" for narrator, chorus and orchestra with text by author Frank McCourt, and completing a new book "Nine Lives of a Musical Cat"
Some holiday concerts in December TBA.